If you've got an iPhone or iPad packed full of great photos or videos, watching them on your device's relatively small screen may not always be good enough. Some things just look better on a really big screen—like your HDTV. In that case, you need a way to get an image from your iPhone or iPad onto your TV. Luckily, there are lots of ways to stream from your iPad or iPhone to your TV. Here are four of the easiest and most common. Maybe the simplest way to stream from your iPad or iPhone to your TV is just to connect them using a cable—but you can't use just any cable. Because the iPad and iPhone use Apple's proprietary Lightning connector, you need an adapter. Pick up Apple's Lightning Digital AV Adapter (generally around $50 from Apple) and you're halfway to streaming. Use an HDMI cable to connect your TV to the adapter and then plug the adapter into your iOS device. Switch the input on your TV to whatever HDMI port the cable is plugged into and you'll be seeing your iPad or iPhone on the TV right away. 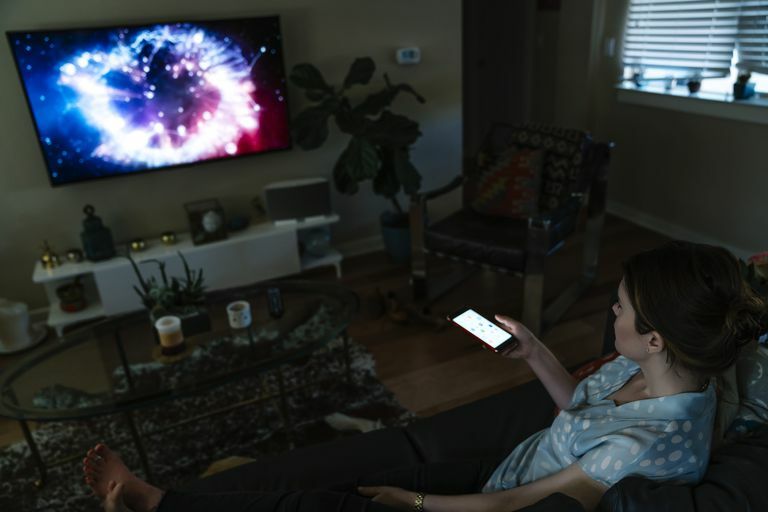 Whatever photos, videos, or other content you see on your device will show up on your TV, too. The Apple TV offers a big library of apps and games. Apple Inc. If you prefer to go wireless and to have the device you use for streaming bring a bunch of other features to the table, check out the Apple TV. Apple's set-top box can do lots of things: stream Netflix, HBO, or more; play games from the App Store; deliver music from Apple Music; serve as a hub for Homekit-compatible smart home devices. It's also the thing that you stream content to from your iPad or iPhone. First, make sure your Apple TV and iOS device are both connected to the same Wi-Fi network. On the iOS device, open Control Center. In the menu that appears, tap your Apple TV. In a moment, your iPad or iPhone screen will appear on your TV, ready to stream photos, videos, and other content just by viewing them on your iOS device. When you want to stop mirroring the screen, open Control Center, tap Screen Mirroring, and then tap Stop Mirroring. Apple isn't the only company that offers a device that attaches to your TV and supports streaming. Google's Chromecast does very much the same thing. It doesn't integrate with Apple services—there's no Apple Music, iCloud, or iTunes Store here—but it does support Google properties like YouTube and Google Play. In addition to that, it lets you stream select content from your iOS device to the TV the Chromecast is connected to. Make sure that the Chromecast and iOS device are connected to the same Wi-Fi network. Open a Chromecast-compatible app, like Netflix, HBO, or Hulu, on your iPhone or iPad. Start viewing the content you want to see on your TV. Look for the Chromecast icon (a square with a Wi-Fi icon in its side) and tap it. If there's more than one Chromecast on your Wi-Fi network, select the one you want to stream to. The content from your iOS device appears on the your TV. You don't always need to buy extra hardware to stream your iPad or iPhone to your TV. If you've got a smart TV that supports DLNA, all you need is a compatible app. DLNA (Digital Living Network Alliance) is a group of consumer-electronics companies that work together on a standard technology that lets gadgets communicate with each other with a minimum of setup or fuss. Tens of thousands of electronic devices support DLNA, including Blu-ray players, game consoles, computers, and—most importantly for these purposes—TVs. Not every TV supports DLNA, but many modern "smart" TVs do. If yours does, you can install a DLNA-compatible app on your iPhone or iPad, add content to it, and then use it to stream to a TV on the same Wi-Fi network as your iOS device (some protected content, such as videos from the iTunes Store, may not be playable via these apps because they don't support DRM). Different apps offer different features and have different steps for streaming, so they can't all be covered here. But the general process is the same: add content (i.e. movies, TV shows, etc) to the app on your phone, connect your phone and app to your TV, and then stream content. Good DLNA apps will either include instructions right in the app or on the website of the company that makes the app.